Short shag hairstyles are immensely popular among Hollywood celebs with the likes of Sharon Stone, Meg Ryan and Susan Sarandon having sported short shag hairstyles from time to time. It is still considered one of the most versatile hairstyles of all time. 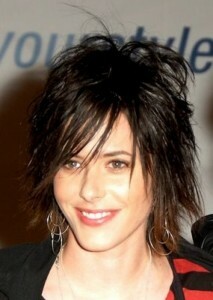 Shag hairstyle offers a whole lot of possibilities irrespective of the hair texture and hair length. Typical features of a shag hairstyle include layers around the crown and choppy ends. It is mussy, casual and visually effortless. While selecting a shag style, you must also keep in mind that modern short shag hairstyle is decidedly different from the 1980s. Nowadays it is choppier with a lot of texture.